Field Kitchen on the Railway line. 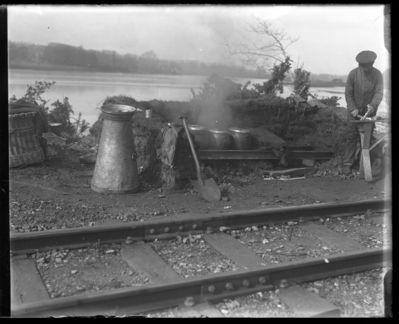 Glass plate negative showing a field kitchen on the railway line. A soldier from the Railway Protection, Repair and Maintenance Corps can be seen preparing a meal for the troops. This glass plate negative was used in the April 1923 An tÃ“glac, Volume 1 publication.